Improvements have been made to rainwater harvesting systems making them easier to install for self-build domestic installations. 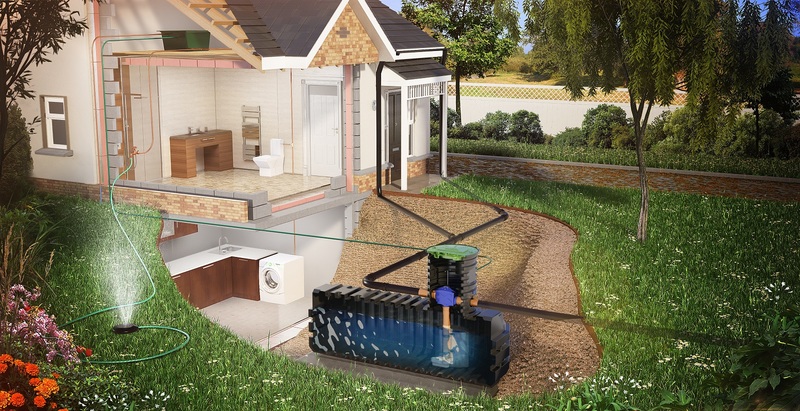 Kingspan has launched a new premium ‘shallow dig’ domestic rainwater system, which joins the company’s well-established portfolio of rainwater-recycling solutions. The Gamma Rainwater range is a low-cost installation for self-build projects and residential developments. Its profile requires a shallower dig and less excavation than traditional rainwater harvesting systems as well as less backfill to secure it in place. It’s also ideally suited to rocky strata conditions where deep digs are not possible. Gamma is designed as a ‘fit-and-forget’ system, providing homeowners with a seamless, automatic supply of harvested rainwater. It works by channelling rain from roof gutters, filtering out leaves and debris and then storing the water in an underground tank. This water is then conveyed to appliances (WCs, washing machines, outdoor taps etc) either directly, via a header tank, or is pumped directly from the main storage tank where a tank is impractical. Systems which supply WCs or washing machines are automatically backed up with mains water at no inconvenience to the householder. “Limiting water usage is now a legal requirement in the UK for new build domestic properties; Building Regulations require that water consumption is limited to 125 litres per person, per day. Manufactured from tough polyethylene, Gamma’s underground tank is robust and lightweight, making it easy to handle and install. Tank sizes range from 2,350 to 4,600 litres. Gamma is fully compliant with all regulations and standards, having been tested in accordance with EN 12566 Part 1 and BS 8515:2009.